A thank you for hearing me in my silence, listening to me in my pain, caring about me in my time of need, being intuitive and respectful, thoughtful & insightful. The littlest things you do mean so much and give me things and moments to cling to. Like flowers blooming on a dull day or an umbrella sheltering me frm heavy rain...I won't forget your kindnesses & our connection, & how you "forget me not"
Oh how much do I love this quote and many others by John O'Donohue who's book Anam Cara is such a classic - you must check it out if you haven't already. 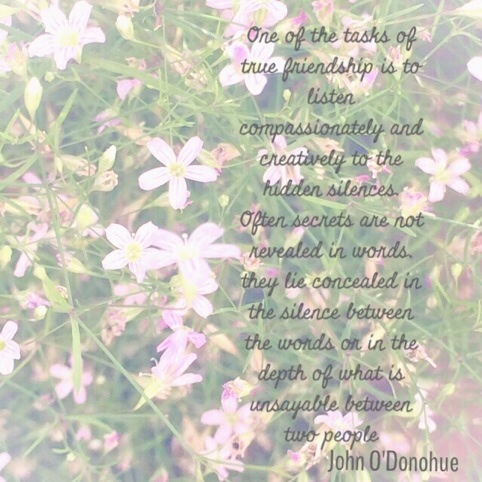 This photo and words is dedicated to my friends, who hear me when I'm quieter than I would choose, who listen to the words in between our conversations, who decipher the silence and who know without my having to tell them what I mean, how I am, and so much of the time intuit what I feel. You are the stars in the night sky who's light reminds me of my own, you are such a big part of what helps me feel I belong and your friendship and care for me, reminds me continually to hold that same kindness towards myself, thank you! My friend Naomi has her article in the Telegraph newspaper today. It's about our mutual friend Emily who passed away in spring 2012. I am popping up this little entry to honour Naomi and all that she has come through, both within the illness and what it took for her to write this piece for the paper. She is truly a remarkable person who shines bright like a diamond even in the darkest of skies. We all have had M.E. (chronic fatigue immune dysfunction syndrome) for over 20yrs, since teenagers. It has meant due to extreme exhaustion and other symptoms, for the most part we have been in the house and often bed for 95% of that time. It is possible to recover fully or in part, but its a long journey. 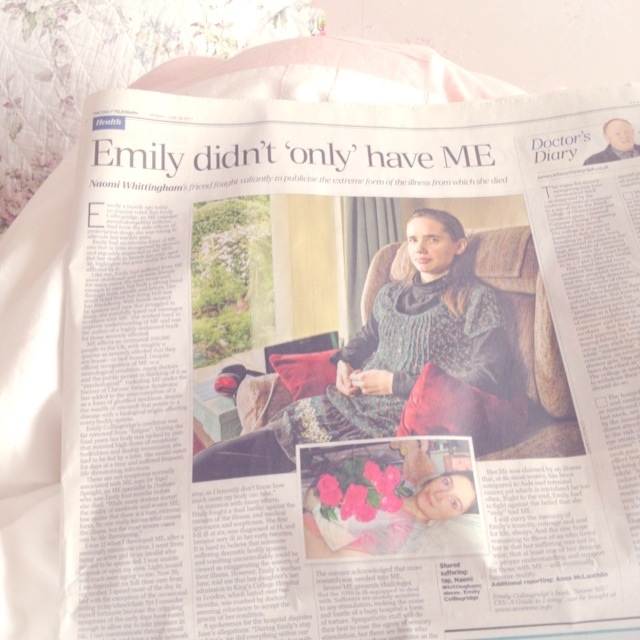 It is only life threatening in rare cases, but tragically one of those cases was Emily's. All of the friends I have who are poorly, are amongst the bravest, kindest, most compassionate people I have ever had the honour to know. Not a day goes by that I am not influenced, inspired or motivated to continue in my healing, because of what I have come to understand and value, both from knowing them, and from what i have learnt through seeking to heal the illness itself. Energy to do things is taken for granted by most. If you want to imagine what ME looks like, think of a car without its battery or fuel, seemingly ok from the outside, yet it can't be driven off the drive. It means you are v limited in what you can do. What you have close, becomes precious, when you can manage to see someone even for a few minutes, or experience the world in a small way, it holds so much more worth. The small things, really do become achievements & so appreciated! I think you can understand how much I value both what I share here and at instagram, and also seeing the world beyond through your eyes and your experiencing of it. The community feel of blogs & instagram brings me so much. Thank you for honouring my path and supporting my healing, silently, or through our connecting and chatting. You my friends, make a huge difference. I am away from Secrets, you may have noticed my lack of posts. I have had to put my attention on a phase of my healing. I will be able to write about that at some future point. Meanwhile I still share some pics over at instagram. Tiny forget me knots (love) and a postcard of violets (love too!) which is now in this frame. My friend louise made me this for my birthday in january, its hanging beautifully above my bed. Thank you for your comments and for continuing to visit, even when i havent been around as much as i would wish to be. we are into january, i want to try and post a bit more, i am not feeling much better in that physically i'm very weak & the past few months have had to remain in bed, but certain things have altered. i also miss my blog, so i am going to see if i can do a little post here, as and when i can. These are photos by friends, they show the cushions i sent them for Christmas. Each is made with a different vintage hankerchief or fabric, and has Love embroidered in the centre. I got them from lovely Luca, her shop is Sesame and Lilly. and every now and then people come into our lives and change it in a fairytale sort of way, by that i mean it has a magical feel, and gifts you with the opportunity to be accepted as you are, and yet at the same time expand your understanding of yourself through what you share with each other. that is certainly most true of my dear friends in California, maddy and cheryl. inside one of the packages from them in america...these little treasures were from Yosemite national park! and some trinket dishes, that are so pretty, scraps of fabric from which they make the skirts for the etsy shop MissTeapot dressup and a butterfly bracelet. it is just as nice to send packages in return, and share my own little world with them, i am inspired to find things to send that are fairy-like. they don't necessarily have to cost a lot, but mean so very much to the reciever, making them smile with that special kind of feeling you get at the end of a fairytale, a happiness from the simple things in life, like a handwritten letter from a friend. this is one of the first parcels i sent cheryl last November, with a vintage copy of Enid Blyton's The Enchanted wood, and Liberty fabric, and vintage lace. Now and again something special happens, that's all sparkly and magical..
and that was definately so for Friday, when Jules came to see me. to chat with a dear friend and share a cup of tea and homemade ginger biscuits. And we exchanged little pressies to mark our first time meeting up too. I placed my gifts in an Orla Kiely box as i knew she liked her designs. Jules was so very kind in her giving, even got me a special Secrets of a butterfly mug! we know personally about the often overlooked power of a truly kind heart. We have been helped by kindness, at times when we greatly needed support. So we want to honour it. We both like to pass kindness on to others. As well as treasure the kindness we receive. of how kindness has touched their hearts. well, the flu has finally passed, and after 3 weeks in bed, i had my first afternoon up yesterday. Going to take some time to get back to where i was, but it felt good to feel more me again. And i am full of ideas and things to share with you all. After the spring clean my blog had a few weeks ago, i want to aim for a more cohesive feel once more to my posting, and get one or two fresh regular posts going. I have some in mind, but am always open to hearing your ideas if you have anything you would like to hear, see or read from me, drop me a line or two, or comment here. I want to say a special thank you to Jules for the postcard in the top pic, and Claire who sent me these beautiful goodies, including some ever so pretty bags to use in my giftwrapping. Thanks sweetheart they arrived on a day i was so very in need of a boost to my spirits and opening this was just the tonic i needed, it meant so much to me, along with having your friendship in my life. Who would have thought little square world within instagram, could spill out into such rich and heartfelt connections, with you Helen and Jules! If youre reading this and havent joined iNstagram i really recommend it, and now anyone on android phones (that means you Shanon!) can join in too.